Why is the 2011 Vintage Port special? Why is the 2011 Vintage special? In a sense, all Vintage Port declarations are special as they only occur when the vintage is deemed to be of exceptional quality. 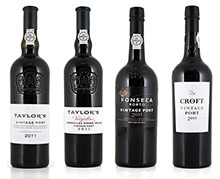 The top Port Houses, such as Croft, Fonseca or Taylor, will not declare a year unless they are convinced of the wine’s quality and capacity to age. Also, because of the effect of climate on the vineyards and on each of the many individual grape varieties used to make Port, no two years produce Vintage Ports which are exactly alike. Although it is possible to identify common characteristics in the wines of different declared years – such as similarities in depth, weight or structure – these comparisons are not always very useful. The 2011 harvest in the Douro Valley followed a near-perfect ripening season which produced wonderfully balanced, classic Ports. The winter preceding the 2011 harvest was wetter and colder than the 30-year average. Budburst occurred as usual mid March and warm weather and rainfall in April produced vigorous growth. At the beginning of May dry conditions set in and there was little rainfall in eastern areas of the Douro until late August. However the vines were able to draw from the plentiful ground water reserves built up during the previous winter and bunches developed and ripened in ideal conditions. Véraison occurred a little earlier than usual on 15th June. Mild weather in June and July was broken only by a heat wave in the second half of June. August was hot and dry, with perfectly timed rainfall on 21st August and 1st September rounding off an excellent ripening season and producing a well balanced crop. The 2011s stand out for the purity of the fruit and the quality of the tannins, which are silky and well integrated but provide plenty of structure.